A man has apologised to the RSPCA after footage of him throwing a sheep into a field went viral. After being retweeted more than 8,000 times on Twitter, the video filmed near Stoke-on-Trent prompted the RSPCA to ask people with information to come forward. It is understood a man has now come forward and the RSPCA has released a statement. It reads: "We understand how upsetting people found the video which showed a sheep being thrown into a field in Staffordshire. "We appealed for information so that we could find out more behind the circumstances of this video. The man in the recording has come forward and we have also been able to locate the farmer who owns the sheep. "The farmer and an RSPCA inspector have checked the sheep and fortunately none of the sheep have any broken legs or appear to be injured in any way. "We understand that the sheep in the video is being treated for footrot, which can make the sheep appear lame while walking. 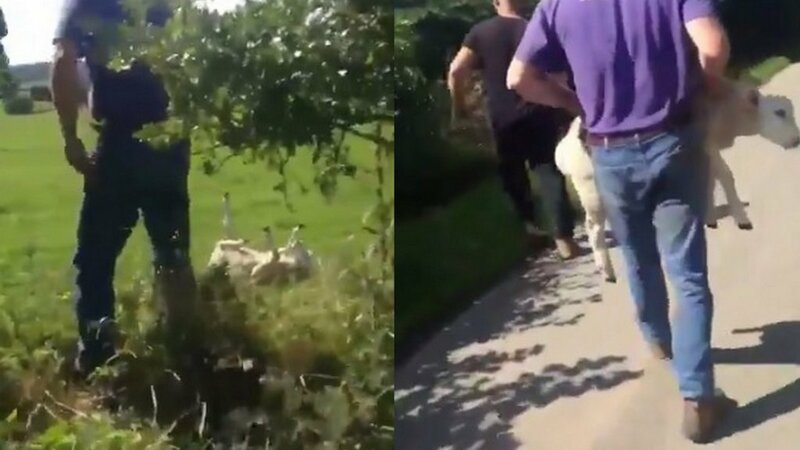 "The RSPCA has also spoken to the man who was filmed throwing the sheep into the field and he has admitted the incident was a genuine misjudgement on his part. No further action will be taken. "We appreciate people are concerned for the welfare of the sheep, however please be assured that the sheep is not injured as a result of this incident. "We will always take reports of cruelty and neglect seriously and we’d like to thank everyone who came forward with information."